A Federal High Court sitting in Abuja has fixed May 27 to deliver judgment in the trial of former President Goodluck Jonathan’s cousin, Robert Azibaola and his company, One Plus Holding Limited. The Economic and Financial Crimes Commission [EFCC] is prosecuting Azibola and his company, One Plus Holding Limited for allegedly taking possession of the sum of $40 million from the Office of the former National Security Adviser [NSA], Col. Sambo Dasuki, and converting same into personal use. The Commission had earlier closed its case against Azibola after calling 10 witnesses and other documentary evidence. 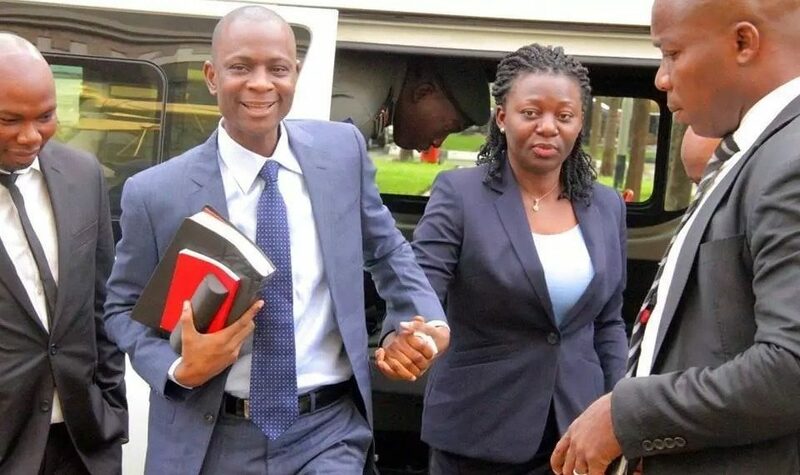 Initially, the EFCC had preferred a seven-count charge against Aziboala, his wife, Stella and their company, One Plus Holding Ltd. But the defendants, responding through their counsel Chris Uche, SAN filed a no-case-submission, insisting that the federal government had failed to establish a prima-facie case that would warrant them to enter defence. Justice Dimgba, ruling on the no-case-submission, yesterday, held that Aziboala (1st defendant) and his company, One Plus Holding Ltd (3rd defendant) have explanation to make in respect of counts two and three and subsequently ordered them to respond to the charges. In count two and three, Robert Aziboala and his company, One Plus Holding Limited were accused of being in possession and conversion of the sum of $40m received from Dasuki into personal use. Justice Nnamdi Dimgba who delivered the judgment however discharged and Acquit Mrs Stella Aziboala, of all the nine-count charge levelled against her by the federal government. Her husband, Robert Aziboala was however not as lucky as the Federal High Court, Abuja trying them over corruption allegations ordered that he open his defence in two of the 9 count charge. Justice Nnamdi Dimgba, in discharging Stella, in respect of counts 2 and 3, held that, just because Mr. Azibola is a spouse of the 2nd defendant, is not enough to charge her. Criminal liability is personal; it is not vicarious.” Justice Dimgba held. However, in his defence, Azibola told the court that he being vilified by the present administration for serving his country. Led in evidence in chief by his counsel, Goddy Uche (SAN), he narrated that apart from being chairman of several companies, his background as an activist spanned from his university days to pro democracy activism and environmental crusader. Aziboala told the court that he founded the Nigerian Delta Human and Environmental Rescue Operation. He also claimed to be a member of several non-governmental organisations committed to fighting for the common man and champion the crusade against environmental degradation in the Niger Delta. As president of Niger Delta-HERO, Aziboala said he led several protests as an activist to protect Niger Delta region and Nigerians in general and the fundamental human rights of everybody that is alive. Laying the foundation for his evidence in chief, he told the court that he led the Movement for the Survival of Ogoni People (MASOP) to advance the cause of Ogoni people. More so, Aziboala stated that in the cause of campaigning for the enthronement of democracy, “I was arrested and detained by the State Security Service and other agencies. “My Lord, I have served Nigeria and I am conscious of the fact of coming from the minority. I interfaced with virtually every pro-democracy activist in this country. “For my sake, the late Ken Saro Wiwa was arrested. He was my mentor. When he was killed, I abandoned law practice and became a pro-democracy and environmental activist”, Aziboala narrated. The defendant disclosed that because of his activism, he embarked on several international speaking tours on behalf of Nigeria and Nigerians. “At a point, people I recommended visa for were given because of my background as a human rights promoter and environmental protection agent. Robert said the money was not for a contract but for him to use his expertise and knowledge of the Niger Delta region to halt oil flow disruption by militants. He said this on the second day of the resumption of his defence in a case of money laundering brought against him and his company by the Economic and Financial Crimes Commission, EFCC. Robert, who is a lawyer and environmental activist also revealed that he risked his life and traversed the vast Niger Delta creeks and interacted with the elements who were bombing oil facilities and disrupting oil flow in the area. According to him, by this efforts the oil firms were able to increase production from less than 700,000 barrels per day to over 2.2 million barrels per day. “The Oneplus Reserve Account was opened for the purpose of the assignment. For the purpose of accountability, we opened separate accounts for each project as foreign missions do. That’s why Kakatar has about 40 different accounts for various purposes such as salaries, taxes, projects, etc. “It was in the course of executing this assignment that we incurred all the expenses we incurred and we have documents to back all of these,” he said. He continued, “In September 2013, oil bunkering, pipeline vandalism, crude oil theft took over 10minutes of the Presidential media chat. As a result of the concerns by the federal government, Col. Sambo Dasuki soon replaced the late Gen. Azazi as the National Security Adviser. “When Dasuki saw Azazi’s brief on the situation in the Niger Delta and oil production statistics, he invited me to discuss the issues of oil spill, pipelines vandalism, etc. Clearly, then, there was need for a civil response to oil bunkering in the Niger Delta. “Then Dasuki got $1bn from the NNPC with the President’s approval. To the best of my knowledge two contracts were awarded to two different Israeli companies. They were to build a command and control in Abuja and they are doing it now. “Next, the NSA asked me to write him a letter of undertaking that I will do what he had asked me to do. It was an assignment, not a contract. We did the assignment diligently and saved the country billions of Naira. “We gave money to people in the creeks, those doing the illegal bunkering, militants in the creeks and we have record of the disbursement “ In 2016 the EFCC, without any invitation, invaded my home. I got the information and voluntarily went to their office to report myself. “But they turned me back and asked me to return the next day and I did. They searched my house and office thrice and took away vital documents relating to the $40m assignment. “The EFCC took my statement, interacted with me and my wife only on three nights and never interacted with me again for the three months I spent in their custody.